Have you ever had the desire to get off the beaten path and explore on your own or with a friend? How about using your compass to plot bearings from a contour map for a remote fishing trip to a secluded lake or stream? Or what about that backcountry hike you have always wanted to take to "get away from it all" but were concerned about getting lost? Wouldn’t it be great to have the calm assurance that within moments you could know right where you are and which way you need to travel to get back to your vehicle? Spend time with us in the following courses and learn to travel accurately off-trail with complete confidence. The following courses will provide basic through advanced training in either standard navigation methods (Map & Compass) and/or present day modern GPS navigation technology. Understanding necessary terminology for GPS and Map/Compass. Accurate and effective map reading for GPS & M&C. Initializing & calibrating your GPS so it works properly. Saving and editing locations in your GPS. Common mistakes made by GPS users and how to avoid them. How to utilize contour maps and a compass with your GPS. Understanding and plotting map coordinates. Entering desired positions into your GPS. How to plot UTM coordinates from your map. 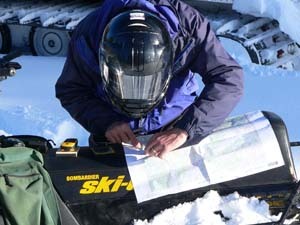 Following bearings with your GPS and compass. Plotting azimuths (bearings) with your compass. 3 North’s: understanding & dealing with True, Grid and Magnetic as they relate to map, compass, & GPS. How to navigate accurately to distant targets. Tips on when and when not to travel after dark. Handling poor visibility situations with confidence: darkness, white-out or dense fog. Learn to navigate accurately during poor visibility. Discussions will include how to prevent common navigation errors in low-light situations. Route selection in rough terrain. Teamwork and individual skills will be taught and used during the training. This class is designed to teach you the basics in applying GPS in diverse settings. Training will begin indoors and transition to field work.Plan to hike a lot...and learn a wealth of information as you participate in this exciting course. GPS overview – its development, how it works and why it works. Initializing your GPS so it works properly for your location. Handouts for important key functions with your GPS. How to utilize USGS contour maps and a compass with your GPS. How to plot UTM coordinates from your map (essential for land applications). How to use the coordinate system that works best for your applications. How to easily plot your GPS position on a map should you become "lost." How to follow bearings with your GPS and compass. The morning segment of this course takes place indoors. The afternoon session transitions to forested areas with varied terrain. This course takes place in the field and is specifically designed for all land-based applications: Hunting, hiking, backpacking, dnowmobiling, snowboarding, mountain biking, skiing, mountaineering, search and rescue, etc. It is also great launching point for all guides, instructors and other outdoor enthusiasts. It is physically demanding and mentally challenging. Common GPS menu options most suitable to your needs. How to accurately communicate your GPS location to others. Tips to ensure your return to previously saved GPS locations. Estimating and planning for GPS inaccuracies in the field. A review of key backcountry applications. This event will test and refine all of your GPS navigation skills. Extensive GPS plotting, route selection and hiking in varying types of terrain. Learn to deal with just about every situation that could possibly occur on any future outing you may take with your GPS. Altimeter use with your GPS will be taught and discussed to assist you in pinpointing your locations on maps. Plan to hike several challenging miles off-trail as you hone all previously learned GPS techniques. Travel tips for limited visibility applications. Boosting your confidence in how to accurately navigate during poor visibility situations. Tips to ensure your timely return to previously saved GPS locations after dark. Ways to insure that others can find you in a timely manner. How to establish and work from baselines while attempting to find a specific location. A mock-rescue with emphasis on finding others, or enabling others to find you. Hiking to a variety of saved waypoints you plot from contour maps, or coordinates provided by your instructor(s). Overcoming obstacles in the field. Search techniques for the "needle in the haystack" during limited visibility situations. Successful completion of this GPS course will dramatically enhance your resume as well as all future backcountry adventures. This is a great GPS skill’s test for all guides, instructors and other outdoor enthusiasts. This course combines all the content and skills listed in the Standard I-IV skills training. The first day begins indoors and then transitions to the backcountry for the duration of the training. A key advantage of this format over the others – evenings of discussions and training, and a continuous program from start to finish. Consider this training a vital prerequisite for a career in backcountry-related travel or employment. The training reviews the content of the Comprehensive GPS training, yet also provides a format for every participant to instruct others in the group on a rotating basis. Strengths of this event – extensive hands-on training, instructional experience, and virtually nonstop learning experiences. Participants become certified in this specialty only after successfully completing and teaching all aspects of the training, as well as written and hands-on field testing. Successful completion of this course will dramatically increase your confidence for navigating in the wilderness. This course combines the content of Map & Compass Level 1 and 2. The first day begins indoors and quickly transitions to the backcountry for the duration of the training. Consider this training a vital prerequisite for a career in backcountry-related travel or employment. The training reviews the content of the Comprehensive Map & Compass training, yet also provides a format for every participant to instruct others in the group on a rotating basis. Strengths of this event – extensive hands-on training, instructional experience, and virtually nonstop learning experiences. Participants become certified in this specialty only after successfully completing and teaching all aspects of the training, as well as written and hands-on field testing. This 6 day/5 night program combines all the content and skills listed in both the Comprehensive Map and Compass and GPS Programs. The first day takes place indoors, while the rest of training takes place in the backcountry at a variety of field locations. A major advantage to this program is that you can get all your GPS and Map and Compass training during the same week. You should never again have a problem navigating after successfully completing this course.